There comes a time for every founder of a rapidly growing entrepreneurial business when you have to decide if you can be the one to both lead and manage into and through this growth stage. This is a tricky juncture, when you transition from scrappy, creation mode into organizational development mode. The development of an organization that’s in the fast-growth stage slams you with many new challenges, some of which are extremely difficult for many founders. - Not too long ago you were fielding five customer service requests a day, and now over a hundred are flooding in daily. - Your sales team was generating twenty or so good leads a week, and now it’s clear that you could generate an order of magnitude more if you just had the people or the right mechanism. - You’ve been up to your ears in the details of planning and developing new product features yourself or with your partner, but now you have too many growing management responsibilities to do as much of that. You’re afraid of losing control over quality and design. - You have a growing list of great ideas, but you don’t have time to flesh them out. - You have identified new big fish customers to go after, but just can’t seem to find the time to pursue them. If you’ve got outside funders, they’re demanding more and better financial reporting from you, and your board is starting to breathe down your neck about preparing for an IPO. But when are you going to find the time? The late, great Peter Drucker stated that failure to create a solid team at the top-management level is the core reason startups go off the rails. It’s critical that you now bring in more direct reports, including a number of high-competency specialists. You need to become primarily a manager. You have to shift from being an entrepreneur to becoming an executive if you’re going to survive and thrive - both the business and you personally (health and sanity). I call this contradiction in the demands made of an entrepreneur the Paradox of Scale; in order to achieve fast growth, you had to be disruptively innovative and improvisational, and in order to sustain it, you have to become intensely disciplined and rigorously managerial. Some founders have no problem at all with this transition. But most entrepreneurs struggle with this change. They may not like the change of pace; or they’re afraid of becoming a corporate soul crusher; or they simply have no passion for or the skill set needed for executive management. Going the wrong direction at this point is one of the main reasons why firms that have hit takeoff subsequently go into a death spiral. Most founders at this point face three key choices. 1. Learn how to manage the complexities of running a fast-growth firm. 2. Stay in some sort of leadership role, but bring in an experienced CEO from outside. So what does it take to transition? Make your organizational structure only as complex as it must be. Keep it as simple as possible to still delegate responsibilities and decision making while keeping your finger on the pulse of what’s going on. Layer in leadership as it makes sense for your processes, systems and size of organization. Too much structure is just as bad as too little. Seek out what’s just right for you. Recruit top-players that complement each other’s skill set and focus on making sure they work well together. One of the biggest mistakes founders make is to continue to hire key roles by tapping their circle of friends and bringing in people they feel personally comfortable with rather than undertaking a more professional recruitment search. If you have a partner, he or she may well become one of these department heads or perhaps the COO who complements you as CEO or vice versa. You may also have one or two other employees who are well qualified to assume key leadership roles. But generally, many of your early employees either won’t truly be qualified to perform at the level you need in these roles or won’t want to. Search for not only the right skill set and expertise, but the right fit for the culture and the dynamics of your leadership team. Any HR person worth their salt will tell you that 9 out of 10 times people hire on skill and fire on fit. So keep fit in mind from the beginning. Hire people who will bring new perspectives and challenge you. If you only hire people who see things as you do and always say “Yes” then you have a blindspot. There is tremendous value in having people surrounding you that are a) smarter than you in a particular subject and b) different from you. Your business is not a social club of cookie cutter membership. If it is, you will fail. It is critical that you hire people - especially for your top management team - with diverse skill set and background. Keep your hands dirty with some details. Delegating does not mean abdicating leadership responsibilities. It is a myth that you just let people run things and you trust them. You do need to be in the details, enough to be aware of what’s happening. But you do not need to be the one doing the work nor serving as singular decision point bottleneck. As the leader - in whatever form that takes for you (CEO, President, COO) - set the vision, expectations and culture. Sit solidly in your new leadership role and let the super stars you brought into the game do the same. 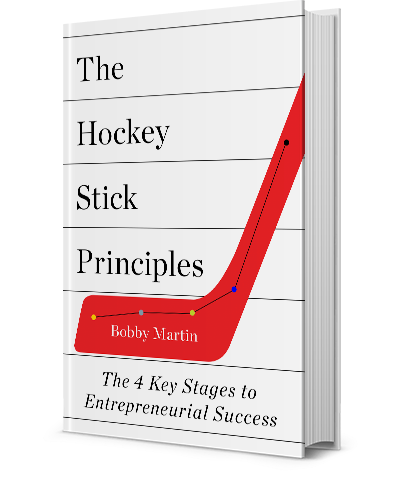 Books, May 2016) Martin debunks the myth that “hockey stick” growth is only for the Googles of the world.